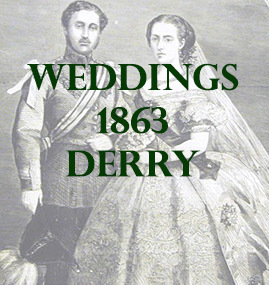 The following list contains marriages that mention places in county Derry. In the Presbyterian Church, Finvoy, Mr. Robert McKeown, Ballyronan, county Derry, to Sarah, daughter of the late Samuel Hamill, Esq., Finvoy, county Antrim. In Derry Cathedral, Mr Samuel Fleming, merchant, Londonderry, to Sarah, daughter of William Fleming, Esq., of Castletown, Island of Inch.